Bucket sieve for screening your own plaster - 1/2", 1/4", 1/8", 1/20" and 1/50"
These sifters fit on top of a standard 5-gallon bucket. They're 13 1/4" round at top and come in a variety of screen sizes: 1/2", 1/4", 1/8", 1/20" and 1/50". They're solidly constructed of corrosion-resistant metal mesh and flexible plastic - they'll bounce if you drop them. 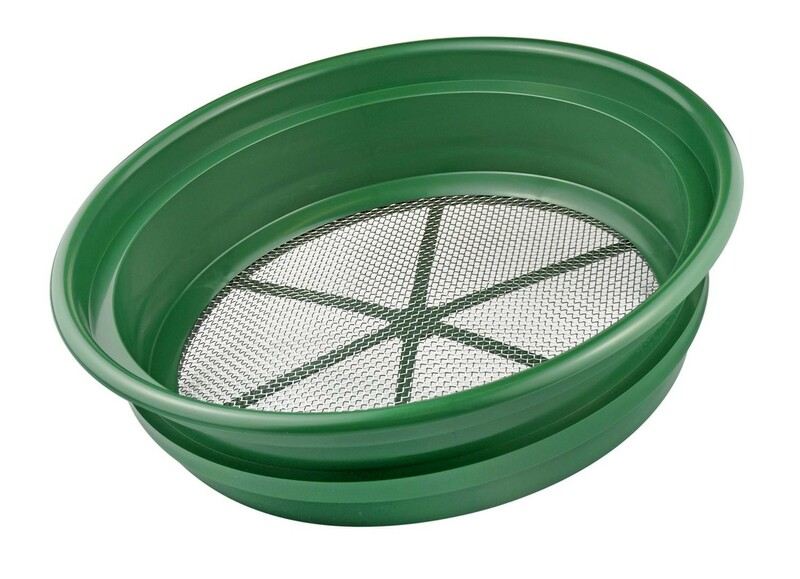 The 1/2" size works nicely for sifting dirt for filling bags or for sifting compost. The 1/4" and 1/8" sizes are great for screening & processing fine dirt for making your own earth plaster. The smaller sizes are more applicable for specialized purposes (gold placer deposits, archaeological excavation). These sifters nest together and different sizes stacked on top of one another (coarser on top, finest on the bottom) can allow quick & efficient classification of samples. They're also used by folks for compost, creating their own custom soils for bonsais, and for placer mining. In addition to fitting on a 5-gallon bucket, this sieve (or the bucket it's nested on top of) will neatly fit in the top of our bag stand, offering you a comfortable working height.